You have a multi-day trekking adventure coming up. Perhaps there’s a big camping/hiking trip planned with all your friends. Or maybe you’re an avid day-hiker that enjoys exploring the trails on the weekend. Whatever the case, you’ve probably already picked out comfortable shoes, a sturdy pack, and the perfect tent. But you’re not yet fully prepared. Headtorches and trekking poles are important hiking accessories that will vastly improve your time on the trails. This guide should help you to understand why owning a headtorch and/or trekking poles is a smart idea. It will also guide you through selecting an appropriate model and tell you how to avoid common pitfalls. As we roll into winter and the days keep getting shorter, you don’t want to be caught out after dark without a convenient light, especially on hazardous trails. Headtorches can keep you safe at night by stopping you from tripping over obstacles such as tree roots or falling into rabbit holes or potholes. They also increase your external visibility, warning cars when you’re near roadsides and helping other hikers keep track of you. They’re also useful to have in your car or home in case of power outages or similar events. To select your headtorch, decide which of the following features are most important to you and find the headtorch that excels in those categories. The higher the lumens, the brighter the headtorch’s beam. If you just want to light your way around camp at night, then you don’t need a super-bright headtorch. On the other hand, if you’re using your headtorch to run on trails and rough terrain at night, you’ll need a bright headtorch to light up obstacles at speed. Keep in mind that brighter isn’t always better: a particularly bright light can make it harder for you to look at maps, and it also reflects light in misty/foggy conditions, meaning you can’t distinguish features as well. The brighter and more powerful the headlamp, the pricier it tends to be. Your choices can range from the 600 lumen Ledlenser NEO10R to the 50 lumen Petzl e+LITE emergency headlamp. Some headtorches use a wide-spread (flood) beam, while others use a narrower, focussed (spotlight) beam. Flood beams allow you to use your peripheral vision, while spotlight beams are great for seeing into the distance. Having the ability to switch between these beam patterns is a great feature. Headtorches may also refer to these as proximity and distance vision. Look for multi- or mixed-beam headlamps like the Petzl Tactikka series if you need these options. Headtorches may offer a strobe light, a brightness memory (so you can turn your light off and on and it will remember your last setting), or red, green and blue night vision modes. 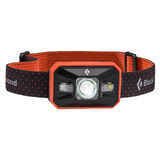 The prime example is the Black Diamond Storm Headlamp, which has all of the above – but you might not need all of them. Decide which features you’ll actually use and keep in mind that you don’t want to be standing around clicking and holding buttons to get back to the setting you need. Nobody wants to be halfway through a hike and have their light die on them. If you’re on long trips and won’t have access to charging points, pick a headtorch with a long battery life. If you’re only going to use your headtorch sparingly, or for short to medium runs, then a shorter battery life isn’t a problem. Remember that battery life changes depending on your headtorch’s settings. Maximum burn times always list the headtorch’s life using the lowest setting. Hint: keep a spare set of batteries in your pack. Even better, store your batteries separately to your headtorch and only pop them back in when the sky gets dark. This will eliminate any power loss during the day. Most headtorches are lightweight. After all, they’re designed to be worn on your head. If you’re an ultralight enthusiast, however, you may want to shave off even more grams and select a superlight headtorch. Just keep in mind that you will likely have to sacrifice battery life, as is the case with the Black Diamond Iota. Miscellaneous uses, such as hanging your laundry, defending against wildlife attacks, and acting as medical splints. It’s essential to purchase the correct pole length for your height. Stand up straight, preferably wearing your hiking shoes or boots, and bend your arm 90 degrees at the elbow so that your forearm is parallel to the ground. If you’re trying poles in-store, choose the one that you can lightly grip in this position. If you are shopping online or want a more exact measurement, then measure from the floor to your elbow in this position to calculate which length pole you need. Fixed poles come in single sizes such as 110cm which you want to get right and usually size for flat ground. The majority of Wildfire’s poles are adjustable for maximum convenience. Height-adjustable poles can be shortened and lengthened to suit your exact measurement. Ideally you want your flat ground measurement to be half way between the minimum and maximum so you have room to adjust for up and downhill. You can also fine-tune them on the trail if you want to adjust your poles according to terrain (generally, longer for descending and shorter for ascending). If you travel with your poles on public transport or flights, ensure that your poles can be shortened and collapsed or folded up. Aluminium pole shafts are lightweight and strong. They make for flexible poles that can bend under very heavy loads but are unlikely to break. Carbon fibre pole shafts are the lightest pole shafts available, so grab trekking poles made from carbon fibre if you’re an ultralightweight enthusiast. Carbon fibre is strong and absorbs vibration and shock so it’s great for downhill slopes. It can, however, shatter easier than aluminium poles if you bang them around excessively. Compare the Komperdell Explorer Powerlock 3.0 and the Black Diamond Distance Carbon Z for the differences between aluminium and carbon fibre trekking poles. Plastic – a cheaper alternative that you should steer clear from, as they can be painful and slippery. Baskets – summer baskets prevent your poles from sinking into mud or getting trapped between rocks. You’ll need larger baskets for snowy conditions. Tips – carbide and steel tips are great for gripping on rock, dirt and ice. If you plan to walk on asphalt or concrete, though, invest in a pair of rubber tips to protect both the ground and your pole tips. Straps – allow you to use poles with a more relaxed grip. Ensure these are comfortable to use by placing your hand up through the strap. Place your hand against the grip, allowing the strap to rest against the web between your thumb and forefinger. Slide your hand down slightly until you have a comfortable grip. Now you don’t have to hold your poles so tightly: the tension applied between your wrist and the strap will serve just as well, if not better. Now that you know the important facts about trekking poles and headtorches, you can select your perfect product and hit the trails knowing that you’re fully equipped to handle whatever the great outdoors throws your way.